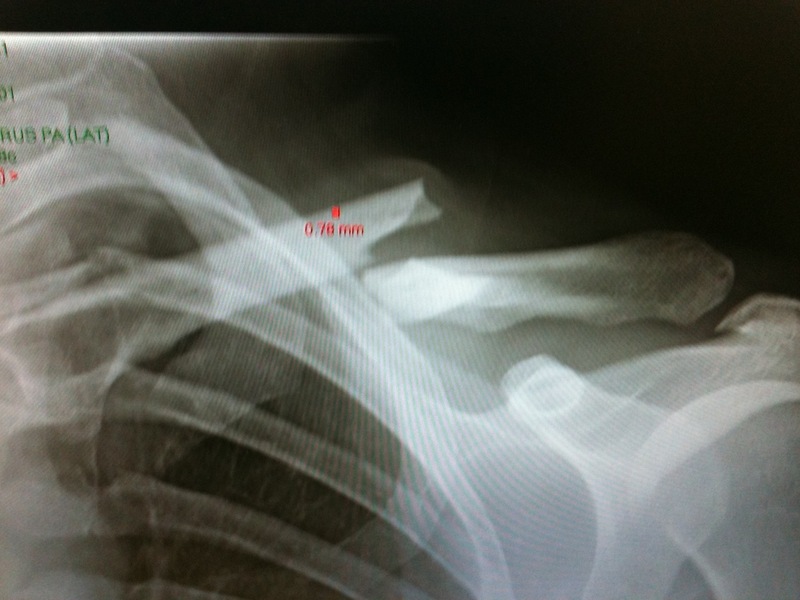 If you’ve read my blog before you’ll know that I crashed & broke my collarbone a couple of weeks ago. I wrote about it here. Today was my first checkup at the fracture clinic since the crash. Just to make the day more “interesting”, we had about 3 or 4 inches of snow over-night in Inverurie. At 8am cars were getting stuck on the hill we live on! Fortunately Jo’s got snow tyres fitted, and we were going downhill, so I was okay. Caught the 8.22am train into Aberdeen without any difficulty, and by 9am I was sitting in Tinderbox with a steaming mug of hot chocolate. 30 minutes later, after checking emails and twitter, I was in a cab and on my way to ARI, where, once again, I was whisked through the system. A few people had warned me that it could be really slow and that I could be in for a long wait. So I packed a bag. I had my iPad, the latest Cycle Sport magazine (which arrived yesterday) and my headphones. I’d be fine. Well, I never had time to use any of them! Turned out the lady at the desk was from Inverurie too. We shared a few tales of travel woe and the next thing I know she’s taking me through for an x-ray. I was in & out of there in a flash and was put in a queue to see the doctor, with my notes handed to me. I had barely finished reading them when the doctor called me through. He was another young guy, had the look of a cyclist about him. He asked me a few questions about the crash & then he pulled my x-rays up on the screen. Today’s certainly looked better than the day of the crash, but as you can see the bone’s still in bits. He wanted to take a proper look at it, so I was taken behind the screen and whipped my tops off. He had a wee prod around it and looked at my shoulder alignment. Definitely a bit shorter on the left hand side. He went to get the Registrar so she could take a look. She agreed, and we had a chat about the options. I have very “pronounced” collarbones, so pinning it could cause problems. As well as the risk of infection, I’d always be left with a scar, and the plate would be very noticeable under my skin. I asked if leaving it to heal naturally would mean it would be weaker and they assured me it wouldn’t – years ago it would always be left to heal naturally. They said it definitely wouldn’t affect my racing so we decided to leave it (although they’re going to run it past the consultant over the weekend just to make sure). And that was basically that! I’d been in for no more than 30 minutes. I asked about training and he said it was fine as long as it wasn’t on rollers! Cut down on the painkillers, the pain should have gone in a week, and make sure to stretch & exercise the arm. Back again on 7th December and we’ll see how things have progressed then. I wince just looking it that! I can’t believe that it will heal itself…I guess the human body is more amazing that we can possibly imagine. Yeah, me too! It’s actually the mirror image of a mate’s, he did his in 2009 and it seemed to have healed okay. Guess you’ve got to trust their judgement….